In hockey, basketball, and other sports I’m sure I’m forgetting, individual players are held accountable for their team’s performance during their time in the game through the plus/minus statistic. This week’s Impact review will attempt to score each segment as a hit (+1; a superior match or well-executed story-building segment), a miss (-1; offensive to the eyes or ears), or a push (+0; a segment that is wholly acceptable, but nothing memorable) in order to find an overall rating to the show. Positives: Dat crowd! You could barely hear Dixie for the first five minutes of the show, which is a good thing on a lot of different levels. There was good heat on her, which if you were a channel surfer just tuning in, would make you think TNA has a strong top heel. Negatives: References to “Mr. Stephanie McMahon” and “Steve” brought this down a lot. So, you’re going to take time to establish a fantasy world in which the owner of a company is an evil ball-cutter, but then you reach outside of the fantasy into the “real world” to make things more serious? Cheap heat. The way Dixie “avoided talking” about Hulk Hogan made it seem fairly certain that he’ll be back sooner rather than later. There were several other references like this sprinkled throughout the show, especially from Taz. Positives: Both of these were very passionate, main event promos. In spite of his total lack of modesty (which is inherently heelish), Aries cut a great promo about why he is a top guy. A.J. was focused on the World Heavyweight Title and beating Bully Ray for the second week in a row, mentioning destroying Dixie Carter as his first order of business once he gets the title. Hurray for mission statements! First you get the Title. Then you get the power. Then you get the Dixie. Negatives: Aries cut a babyface promo on babyface Jeff Hardy. How the heck is the crowd supposed to react to that? Positives: The workrate and spots in this match blew anything WWE is willing to present on live TV out of the water. Aries and Hardy are the perfect sizes and speed to wrestle each other, and each works a style that accentuates the other’s positives. It really felt like both men, who’ve been out of the main event mix lately, came to this match with a message for management. Joe in Ultimate X? That is intriguing. Considering how cluelessly TNA has presented Joe over the last three years, putting him back in the X Division mix is something fresh that can help him reestablish himself as a next-level badass. Negatives: This was a “pay per view main event quality match” (as Mike Tenay says about every match). The only problem: there was all of fifteen minutes of build for it. Steve Austin literally quit WWE over being promoted that way. TNA is using Jeff Hardy to shine Austin Aries?! I know the guy is Teflon, but is that really the best use of one of wrestling’s most over stars? 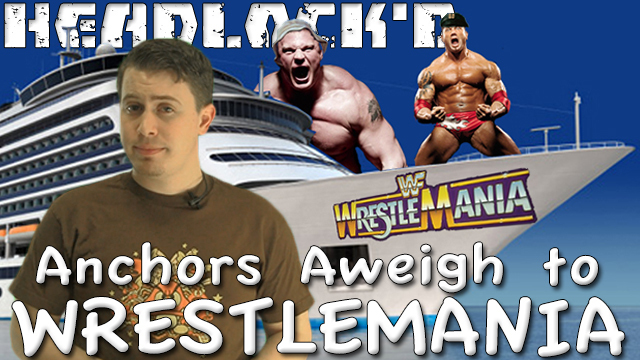 Headlock’d: Anchors Aweigh to WrestleMania!